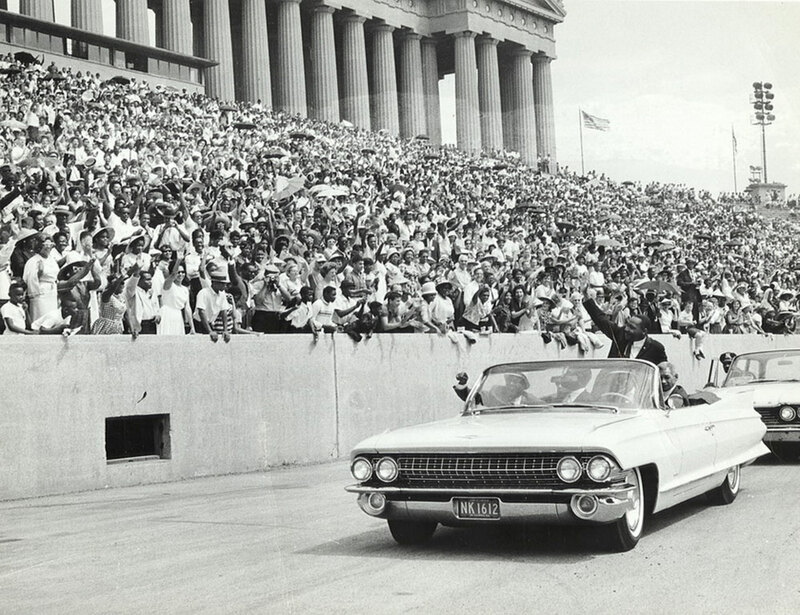 Martin Luther King, Jr. waves to a large crowd from an open car at the Chicago Freedom Movement Rally at Soldier Field in Chicago on July 10, 1966. Bill Berry is seated on his left. Up until the launch of the Chicago Freedom Movement, labor unions had been a critical supporter of the Southern Christian Leadership Conference (SCLC). Renowned progressive labor leaders had befriended Dr. King and had long championed his cause. His close advisers included Bayard Rustin, head of the A. Philip Randolph Institute, an organization supported by the AFL-CIO and other unions that encouraged a greater black presence at all levels of the labor movement; Ralph Helstein, president of the Chicago-based United Packinghouse Workers of America (UPWA); and Norman Hill, a young civil rights leader with the Congress of Racial Equality (CORE) who had become the legislative and civil rights representative of the Industrial Union department (IUD) of the AFL-CIO. SCLC’s turn northward and its decision to make Chicago the center of a campaign to redress economic and social issues would require a more complex, targeted organizing campaign and a more structured coalition with labor than had been necessary in the past. This is an excerpt from “The Chicago Freedom Movement: Martin Luther King Jr. and Civil Rights Activism in the North,” used with permission of University Press of Kentucky. As an industrial epicenter, Chicago was home to a thriving labor movement comprising the old CIO industrial unions and the old AFL craft unions. Because of the influence of the craft unions, the Chicago Federation [of Labor] took a cautious approach to the Chicago Freedom Movement. The industrial unions, however, quickly embraced SCLC’s Chicago drive. These unions, plus some of the newer public employee unions and the lawyers representing them, provided strong support. In particular, Gil Cornfield, a labor lawyer and founding partner of Cornfield and Feldman, a labor law firm that represented many progressive unions in Chicago, became a central strategist in the campaign. No one could have anticipated the energy, resources, manpower, and focus needed to take on the institutional racism embedded in the economic institutions and policies of the North. For the movement to succeed, it would require a melding of labor’s organizing experience and SCLC’ nonviolent philosophy and organizing vision. The strategy was to develop a strong, on-the-ground organizing partnership among SCLC, Chicago community organizations, and organized labor. The enterprises that emerged from this newly constructed partnership were the tenant unions, which evolved into a collective bargaining campaign and resulted in the formation of the Lawndale Community Union. In an effort to reveal the blight and inhumane living conditions of the slums, tenant organizing began on the West and North Sides of the city. With the help of SCLC and its labor leadership, a tenant union federation emerged from the work of the East Garfield Park Union to End Slums and the Lawndale Union to End Slums. Coordinating with these efforts on the West Side were the JOIN Community Union, an organizing effort by the Students for a Democratic Society (SDS) in Chicago’s Uptown neighborhood, and the Tenant Action Council, an organizing drive involving the mixed-income housing complex called Old Town gardens in the gentrifying community known as Old Town. With Cornfield’s assistance, a strategy was developed to challenge each eviction in court, contending that if a tenant’s nonpayment of rent was in response to the landlord’s failure and refusal to maintain the rental premises in accordance with the requirements of the municipal code, this could be used as a defense in an eviction case. In housing court, defense attorneys presented photographs of the deplorable conditions, along with supporting testimony about unheeded complaints to the landlord. This strategy resulted in the finding that evictions were no longer pro forma, and the attendant legal costs would be borne by the landlords. At each eviction proceeding, the court was filled to overflowing with tenants and members of the community. This legal strategy, coupled with the ongoing rent strikes, prevented landlords from breaking the strikes through evictions. Cornfield and other attorneys represented tenants in support of the organizing effort. As more tenant unions were created, more legal support was needed. Barbara Hillman, a new attorney at Cornfield’s firm, and Bernadine Dohrn, a law student at the University of Chicago and leader of the progressive Law Students Committee for Civil Rights, became central figures in supporting the tenant union drive. Melody Heaps was in charge of recruiting and managing legal representation not only for ten ant unions but also for civil rights workers who might be arrested because of their protest activities. Beyond court petitions, the coalition of labor and the Chicago Freedom Movement became the platform for conceptualizing the development of a tenant union federation that would use collective bargaining to change real estate management practices. Collective bargaining would empower residents to demand decent, safe housing and result in a fundamental change in the landlord-tenant relationship. When massive rent strikes in properties held by the Condor and Costalis real estate firm became too onerous, the firm agreed to negotiate. Because of Cornfield’s labor background, the idea of a collective bargaining agreement covering all tenants in Condor and Costalis properties in East Garfield Park and parts of Lawndale was conceived. The collective bargaining approach was intended to improve housing conditions to con form to municipal codes and to strengthen community organization and leadership within a democratic framework. The ideas behind the formation of the Lawndale Community Union were straightforward: people in the neighborhoods needed work, and labor groups were interested in organizing workers. The move from community protests in the form of rent strikes to collective bargaining by tenant organizations was the stimulus for connecting SCLC’s organizing center at the Warren Avenue Congregational Church (the Chicago Freedom Movement’s West Side headquarters) with the Chicago labor movement at the Lawndale Community Union during the winter and spring of 1966. The idea was to identify large, unorganized employment sec tors that could be targeted for organizing campaigns and thus build the bridge between community and labor. With the blessing of national labor leaders Bayard Rustin, Norm Hill, and others, as well as the SCLC leader ship, particularly James Bevel, a plan was conceived to open an organizing center in Lawndale, with staff contributed by SCLC and labor groups. The plan was to link worker organizations with employment and training opportunities through community organizations. As in the case of the tenant unions, the overarching goal was to develop democratic organizations that would be vehicles for improving members’ lives and developing indigenous leadership. Hospitals were the biggest and fastest-growing unorganized sector of the economy in metropolitan Chicago. Only the University of Chicago Hospital was organized (accomplished by the CIO before its merger with the AFL). Rustin, Hill, Shier, Cornfield, and others developed a game plan to secretly place organizers in many of the major hospitals. The code name for this project was HELP—the Hospital Employees Labor Program. A number of experienced organizers from CORE, SCLC, and IUD obtained jobs in the hospitals, and HELP took significant steps toward implementation. On the eve of the launch of the organizing drive, however, the targeted hospitals recognized a joint Teamsters–Service Employees International Union, thereby thwarting the Lawndale Community Union’s efforts. It was assumed that the hospitals had learned of the movement’s organizing drive and seized on the opportunity to enter into a quick settlement. Although unionization was supported by all, the model developed by the Lawndale Community Union would have promoted institutional social and economic justice though labor and community organizations. With no possibility of continuing its hospital organizing efforts, the primary program of the Lawndale Community Union fell apart by October 1966. They had hoped for a different relationship between the labor movement and the civil rights movement—one that would spread like wildfire out of Chicago. This setback for the Lawndale Community Union came at a time of mounting pressure on Dr. King and the Chicago Freedom Movement. To be sure, Jesse Jackson’s Operation Breadbasket was opening new job opportunities in companies that had previously employed only whites. But the turbulence over the Summit Agreement in late August 1966, which brought the Chicago movement’s open-housing campaign to a close, along with the rise of the Black Power approach to tackling racial inequity, undercut the ability to focus on the civil rights–labor partnership. Furthermore, Lawndale Community Union staff found that their SCLC colleagues had difficulty making the organizational transition from projects that were essentially racial, such as the desegregation of public accommodations in the South, to those that were economic and social in the North. The organizing tactics of the civil rights movement and the labor movement were different. The labor movement was centered on industrial organizing. Organizers went into a plant that made widgets or into a hospital to bargain for better pay and benefits, limited work schedules, and work breaks. Under the vision of the Lawndale Community Union, those tactics would be integrated into a movement that challenged the fundamental economic and social issues surrounding poverty and racial injustice in the North. Desegregation of accommodations and voting rights could be achieved by demonstrations in the South. In the North, decent-paying jobs, the improvement of living conditions in the ghetto, and the ultimate destruction of the slums would require a sustained and complex organizing and political effort. In retrospect, it was probably unrealistic to imagine that a civil rights movement focused on southern segregation and voting rights could be turned into a social and economic movement to change the fundamental structure of poverty in less than two years. The issues raised in the 1960s by the Chicago Freedom Movement resonate today. The Occupy demonstrations in 2011 revealed that the economic chasm between rich and poor, between the powerful and the powerless, still exists. Labor unions are in decline, the fiscal gap is widening, and middle-class economic security is receding. These issues, so critical to a democratic capitalist society, are ones that the Chicago Freedom Movement confronted and perhaps unveiled. Although SCLC withdrew most of its staff from the tenant organizing efforts by late 1967, local organizing continued into the 1970s. Cornfield and other attorneys continued to work pro bono for tenants who took their landlords to housing court over seriously neglected buildings. Most landlords settled with the tenants, but one, Jack Spring, did not. Corn field took this case before the Illinois Supreme Court and won. In this landmark case, the court recognized that the obligation to pay rent was contingent on the landlord’s maintenance of the property in accordance with building codes—what became known as an “implied warrant of habitability.” This ruling represented a monumental shift in landlord-tenant law, giving tenants newly recognized rights and moving landlord-tenant law far beyond its English common-law origins in the Middle Ages. Melody Heaps is president emeritus and consultant of Treatment Alternatives for Special Clients (TASC), a substance abuse and mental health agency in Chicago, that she founded in 1976.